When builder Dennis Scholl moved to Fort Collins, CO last spring, he had a radiant vision of the heating and cooling systems that would be installed in the first house he built there. “Comfort is a big part of it,” shared Dennis. Infloor Heating Systems helped make it a reality, complete with custom products designed specifically for his project. From his previous experience with electric cable radiant heating installed during a remodel of his old house in Michigan, Dennis knew hydronic radiant heating was the way to go moving forward. “While forced air is common, it is also noisy and requires vents,” he said. “Hydronic radiant heating was something I wanted.” He said the house has a much cleaner look, is quiet, and most importantly very comfortable. The new 2,350 sq. ft. sprawling ranch, also set to be a showcase house, was built with a hydronic radiant heating system throughout the main level, baseboard heating in the full basement, and a Unico System for cooling. 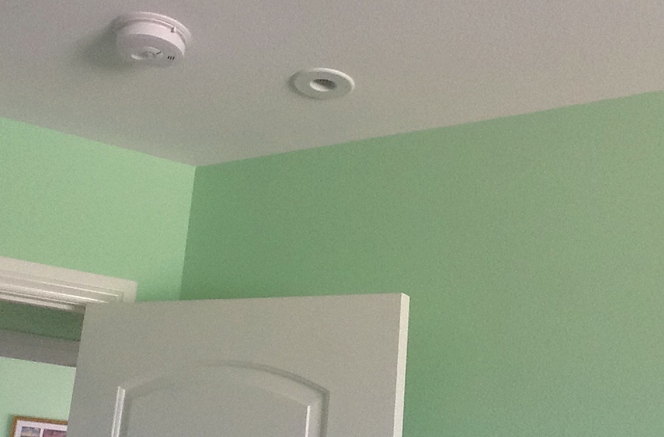 “Starting from scratch is more economical for installing these systems,” said Dennis. He also took steps to ensure the house was insulated extremely well for increased efficiency. 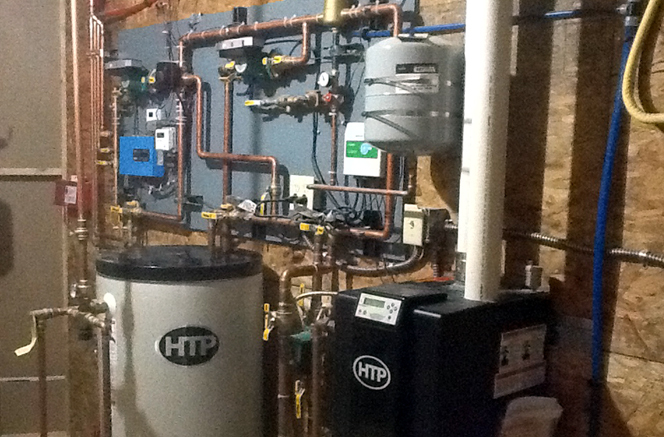 Dennis chose Warmboard for the hydronic radiant heating installation method. Warmboard is a superior product that combines a structural subfloor and a thermodynamically sophisticated radiant panel into a simple system. As a subfloor, it is installed and the tubing laid before other construction takes place, eliminating the need to design the system around interior walls. Warmboard recommended Infloor Heating Systems to Dennis to provide the additional parts, products, and support necessary for completion. 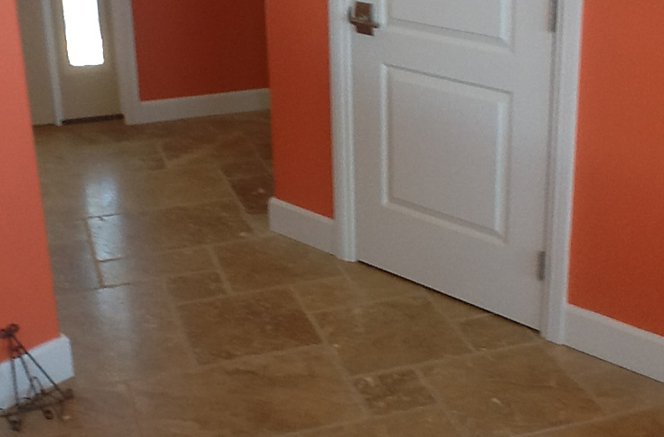 “This was my first project with Infloor Heating Systems,” said Dennis, and he assured it wouldn’t be the last. 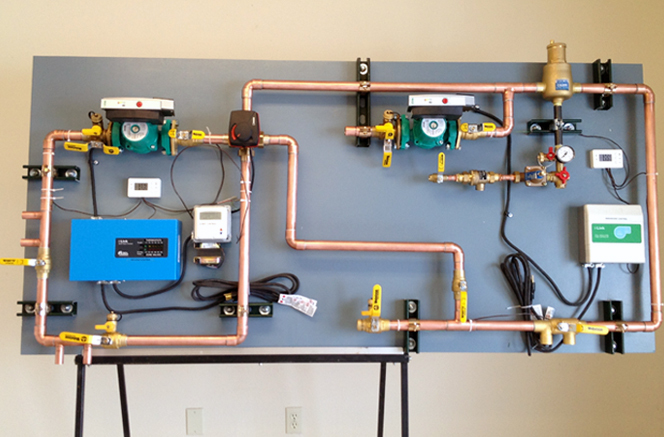 Since Dennis’ system requires high and low temperature water, Infloor designed a custom mechanical board to run two different temperatures, handling five zones of hydronic radiant heating and one zone of baseboard heating. The custom mechanical board was pre-piped and pre-wired, and included a custom drawing, overall installation guide, and a guide for each part on the board so Dennis knew what everything was and how to replace something, if necessary. Infloor took the guess work out of the board for easy installation and added peace of mind. The custom mechanical board has an indoor/outdoor reset control, which takes the outdoor temperature into consideration to determine the water temperature needed in the system. It adjusts the temperature of the water needed to maintain the indoor temperature based on the outside temperature. This increases the energy efficiency, ensuring peak performance. Magnetic drive pumps were added, which senses pressure in the system and adjusts the flow rate based on the number of zones calling for hot water. The board also includes a Zone Valve Control Box (#30063) for easy zoning control of the six zones, and a Universal Digital Temperature Gauge (#30120). His hydronic radiant heating system includes an HTP modulating condensing boiler with an operating efficiency of 95%, and a side arm tank for domestic hot water. Travertine tile was used as the floor covering in 80% of the house, with carpet installed in the master bedroom and spare rooms. For cooling his home on warm summer days, Dennis took another progressive approach by choosing an American-made Unico System; a small duct air conditioning system. Traditional cooling systems “dump” the air into the room which causes drafts and uneven temperatures throughout different parts of the room. Through an air principle called aspiration, the Unico System air enters a room through the ceiling and creates a gentle suction around itself that draws the room air into its stream of air. Aspiration creates an even, draft-free environment and lowers the room temperature. From room to room, floor to floor, and floor to ceiling, the temperature differential is no greater than two degrees. The Unico System fits any space, is quiet, provides draft-free temperatures, removes 30% more humidity, is efficient, and blends into any décor. The Unico System uses less than one-third of the space while delivering up to nine tons of air conditioning in the same space as a 3-ton traditional unit. Small, subtle outlets are available in round 5” outer diameter or slotted ½” x 8” versions, each blending perfectly into your design. Dennis worked with Scott Clark, Director of Sales & Service, for all of his Infloor Heating System needs. “Scott was fantastic,” Dennis shared. “He went out of his way to help me and did a wonderful job. I rate Infloor at a 10 (out of 10) on support. I can’t wait to start another project with them,” he concluded. Let us help you with your next radiant heating project. Contact us today to learn more.